Is Apple Cider the Same as Apple Juice? Technically, apple juice and apple cider are the same as both are made from apples. The difference is in the filtering process. While apple cider is the unprocessed liquid that is extracted from crushed and pressed apples, apple juice is a result of apple cider being filtered, and sometimes with sugar added. Apple cider has a distinct tart taste and can be served either warm or cold, whereas apple juice is clear, much milder than apple cider, and thus a lot more popular with kids. Most commercial apple juice and apple cider are pasteurised or heat-treated for shelf stability and as a guarantee against presence of harmful bacteria. Is Apple Cider Vinegar "Apple Cider with Vinegar Added"? 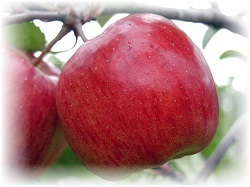 Apple cider vinegar is a special type of vinegar fermented from apple cider. Light yellow-brown in colour, it is often sold unfiltered and unpasteurized with a dark, cloudy substance called mother of vinegar. It has acetic acid (like other types of vinegar) and some lactic, citric and malic acids. During processing, the sugar in the apple cider is broken down by bacteria and yeast into alcohol and converted into vinegar. In 1958, D.C. Jarvis, M.D. published the book titled Folk Medicine: A Vermont Doctor's Guide to Good Health, recommending apple cider vinegar as a powerful alternative medicine. 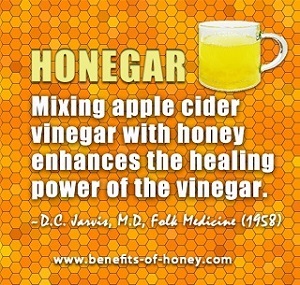 He advised that mixing apple cider vinegar with honey would enhance the healing power of the vinegar. Jarvis also wrote that apple cider vinegar could destroy harmful bacteria in the digestive tract and suggested it as a digestive tonic to be consumed with meals. His book, Folk Medicine became a bestseller. According to Time magazine, hundreds of thousands copies were sold in a single week and many testimonials by people who felt they benefited from the apple cider vinegar and honey mixture were recieved. Read about all the health benefits of taking apple cider vinegar and honey in Apple Cider Vinegar and Honey Remedy. End of "Is Apple Cider the Same as Apple Juice?" Back to "Postings on How Apple Cider Vinegar and Honey Drink Cures (Since 2009)".